Cuttack: Two days after a private bus carrying more than 60 passengers overturned and fell off the Mahanadi bridge on the outskirts of Cuttack on Tuesday killing 10 persons, a committee comprising Cuttack Motor Vehicle Inspector (MVI), NHAI technical team, Tata company technical team, private bus owners’ association members and Jagatpur Police Station IIC today visited the accident site and began probe. Meanwhile, Jagatpur police booked the private bus driver, under Sections 279, 337, 338 and 304 of the IPC. The driver identified as Khageswar Muduli is now undergoing treatment at the SCB Medical College and Hospital. In the accident, that took place on Tuesday evening, a private bus namely Jagannath, ferrying more than 60 passengers, overturned and fell off the Mahanadi bridge on the outskirts of Cuttack reportedly after hitting a buffalo. 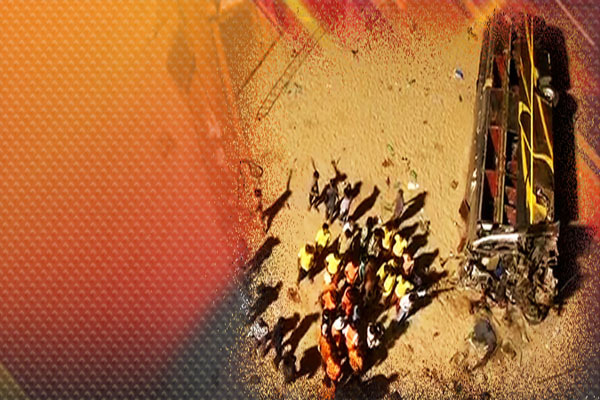 As many as 10 persons were killed in the accident while nearly 40 passengers sustained injuries. The bus was on its way to Cuttack from Talcher in Angul district when it hit a buffalo and fell nearly 30 feet into the Mahanadi riverbed at around 6 pm. The incident took place between Jagatpur and Sikharpur, around 6 km from Cuttack.